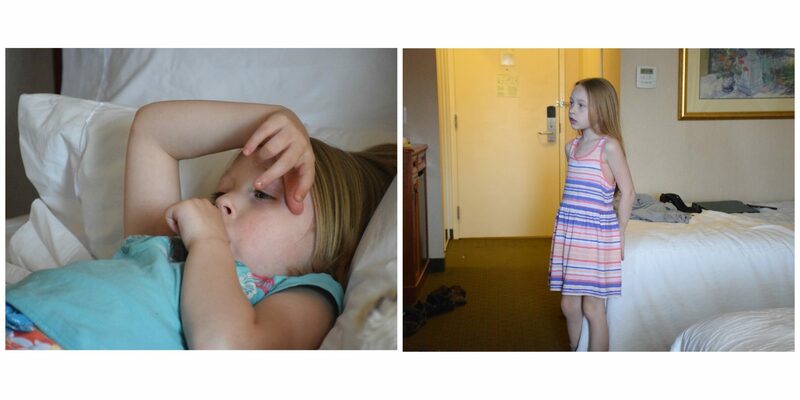 We took a trip to Toronto (which we do once or twice a year) and had yet another hotel stay with kids. This was in preparation for our visit to the Zoo the following day. I’m a little sad to say this stay was the not the best stay we’ve had in Toronto. It was a new hotel choice for us, and it wasn’t bad, but in comparison to our favourite hotel (Delta Chelsea Hotel East) this stay was just mediocre. In retrospect we should have just booked with the place we like (for a few more $$) than try out somewhere new. Get a suite. If you can afford the extra bucks, splurge for a suite. We stayed in one once when Rose was about 6 months old and it worked out well. Emma slept on the pull-out couch in the “sitting room” and we had Rose in a crib in our room. I won’t say it was great (this was back before Emma was happy to go to bed) but it was better than some of our other stays. Now that the girls are older, I think a suite would work out fabulously for us – too bad we’re too cheap to spring for one! Try for King size beds – Queens will do, but doubles are quite small. The more space for sleeping the better! We have a queen bed at home so sleeping next to Patrick in a double bed doesn’t leave much space. This stay we only had double beds so I suggested we share the kids (meaning he sleeps with one and I sleep with the other – strictly for space) but he wouldn’t go for that. Find a hotel with a pool. What kid doesn’t love swimming? This hotel we were at had a tiny pool and there were already a dozen kids in there. That was not fun. The Delta East has a huge pool and we have never felt crowded in there. It’s also great for a time-waster when you’ve done your tourist thing but it’s not time for dinner yet. Just be sure to bring whatever flotation devices your kids need for their swimming level – you don’t often find life jackets available for use in hotels. Don’t stay on the first floor. Although your kids have been asking “When can we go swimming?! ?” and “Are we there yet?? ?” don’t accept that offer of a ground floor room close to the pool. It sounds like a good idea, but this is a very high traffic area in a hotel. We (Patrick and I) were awakened by late arrivers to the hotel – at 1am or so – which can happen on any floor, but they definitely need to be on the ground floor first. Be prepared to go to bed early. Unless you’re keeping the kids up and out of the hotel doing stuff until a late hour, your kids will be tired and ready for bed. My youngest goes to bed at 7pm at home – this visit we didn’t finish dinner until 8 so she was beyond ready for sleep (although she didn’t know it.) Having to have lights out a kid time (“Mommy, can you turn out the light? I can’t sleep……”) can create some boredom in the grown-up world. This is where the suite idea really works out. I actually bought a book light for these occasions, but I find I use it more when I wake early in the morning to read until someone else wakes up. My kids love being at hotels. Something about being able to sleep somewhere that’s not home is very appealing to them. As they get older and can stay up a bit later (without future meltdowns) I will enjoy it more. Something about lights out at 8:30 seems so appealing at home – while I’m struggling to get my older gal to turn out the light – yet unappealing in a tiny hotel room with my kids in it. If you’d like my family and I to stay at your hotel in return for a feature post on my blog, check out my Work With Me page, or contact me! Ahh hotels with kids! I have yet to have a really good experience with my 3. Probably the WORST was when I was taking all 3 kids by myself on a 12 hours drive. We stopped halfway (in both directions) at a sketchy hotel and I bribed them to be good with chocolate chips. I can’t imagine travelling alone that far! You were brave – I totally would have found a bribe too! Thanks for reading and sharing your story! You bring up a great point – the family friendly hotels are so great with kids. Sometimes I find it hard to tell how business-y a hotel is until you get there. If the amenities include a “kids pool” I’m usually convinced that’s the one for us! Thanks for stopping by! The suite is definitely worth it. In fact, now that we have 5 kids it’s a must! Like you said, it’s nice to be able to turn the lights off in part of the room for the younger ones, because my older kids have no interest in falling asleep that early. They are always much too excited to sleep. I can’t imagine what travelling with 5 kids would be like! You must almost need to get 2 hotel rooms! It is hard sometimes to be ready for bed when the youngest is – even though often the youngest doesn’t think they are. Am I right? Travelling with kids can be hectic, even if you get the right room and the perfect weather. Thanks for stopping by! I’m glad you enjoyed my tips! We didn’t do much hotel-ing until the girls were about 3 and 5. It’s really not worth the bother. Now it’s more fun as they understand what’s expected of them and they love swimming in the pools! My kids’ favorite parts of hotel stays is definitely the pool! We have started bringing along sleeping bags for the kids to have a slumber party on the hotel floor – makes it easier to have a smaller room! Love the idea of sleeping bags! I’ll keep that in mind – thanks for sharing Dara! Good tips for our future stay in hotels! We prefer apartments but a hotel is perfect for a 1 or 2 night stay. Thanks Laura – we’ve never done an apartment stay. Might be something to look into! Ya, that was a tough lesson to learn! I love your tent/camping/festival posts. We have never camped with the girls, but I so want to! We won’t stay anywhere where there is no pool when we go aboard. It is our top top most priority. We’ve stayed on a ground floor once next to the entrance and the same thing happened to us too! Got woken up by new arriving guest. They were so loud! lol! Thank goodness they didn’t wake the kids up. I’m happy my kids can sleep through most anything – me, not so much. But a hotel with a good pool is always what we’re looking for. Double bonus if there’s breakfast included!